This is one of Book Culture’s mystery books. Can you guess the book inside? Flying Pig co-founder Josie Leavitt may be retired from bookselling (though she takes substitute shifts now and then), but she still loves books and indie bookstores. Recently, she was in NYC and visited Book Culture on the Upper West Side. She found herself intrigued by their display of ‘mystery date’ books: books wrapped in brown paper with no title, author, or publisher noted, just a few enticing clues to make readers want to take a chance on a blind date with the hidden title. Josie and her partner took a chance on four of these unknown books and were delighted with their choices. They’ve read three of the four so far and all, Josie reported, “were right on target.” One was a short story collection her partner said she wouldn’t have picked up on her own, and she LOVED it. I love this clever idea to get books into the hands ofreaders. Many bookstores have been doing these mystery book promotions, and we can’t wait to try it, too. What books are right for a mystery date? First requirement: they have to be good! 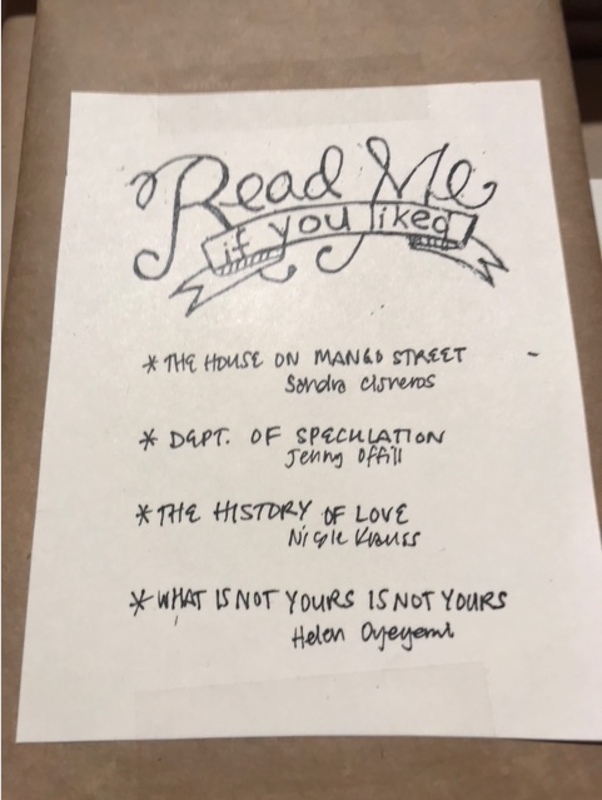 No booksellers in their right minds would put a dud in a wrapper and try to pass it off as a great read; that would be a quick path to your customers losing faith in their recommendations fast. They also should be discoveries; unwrapping a common bestseller would not only be a bit of a disappointment, but it risks being a duplicate of a book the customer has already read. My bookseller friends who have created mystery date displays choose amazing books that, for whatever reason, aren’t quite reaching their potential audience. Either the author isn’t well-known enough to have a wide readership (yet), or the cover and/or title don’t do justice to the content, or they’ve ordered too many copies of a favorite title. Buying one of these mystery books requires a sense of adventure and a leap of faith, but since indies excel at choosing exceptional books and knowing how to recommend them so they’ll reach the readers who will love them, it’s a small leap. We’re going to do a Mystery Date with a Book display with our Valentine’s Day books, and I already have ideas for which titles I want to include. I’d tell you here, but, you know, mystery! We’ll post some of our choices in a few weeks and invite guesses for prizes. What book would you wrap up for some lucky reader to discover, and how would you entice the perfect reader for that book without giving too much away? And can you guess the mystery book at the top of this post? This entry was posted in Uncategorized on February 5, 2019 by Elizabeth Bluemle. We’ve been doing this for quite a while at Books of Wonder and it’s a big hit with our customers. My incredibly and talented staff do it all — choose the books, create the “mystery hints” and even add artistic touches to decorate the brown paper and make the books more irresistible. I can’t take any credit. They proposed it, launched it, handle it, and keep it going. We owners often get the credit for what makes our bookstore’s special — but the truth is, without decades of amazingly talented, caring, children’s book-loving staff, Books of Wonder wouldn’t be what it is today.